This week we are hosting our final visit of the Edmonton Food Bank's "Plant a Row, Grow a Row" program, which will be set up in the Community Tent. They will be accepting donations of non-perishable goods & fresh produce from the vendors, as well as any extra produce you have left from your garden. Also, we are having 3 Thanksgiving Basket giveaways. These baskets are stuffed with the most delicious food from the SWEFM vendors, and are valued at over $500! All you need to do to enter is fill out one of our surveys, or bring a donation for the Food Bank. A reminder to all of our Sprouts: please bring any extra tokens you have been saving at home to the last markets so we can collect them for more kids to use next season! This is also the time to remind you that this is the second last market of the year; Oct. 3rd is our final market day. In 2018 we launched our Young Vendors Program, which gives 13 to 17 year olds a chance to sell their homemade products. This week we are hosting Sam & Sage, who are bringing their arts & crafts. Sunworks Organic Farm raises certified organic and BC SPCA humane chickens, beef, turkey, ducks, geese, pork, eggs. This is your last week to pre-order a fresh Thanksgiving Turkey. Order at the market or online www.sunworksfarm.com . The SWEFM pickup will be Wed. October 3, from 4:00pm to 7:30pm. The order deadline is Monday October 1st at 5pm. La Poutine has up to 19 types of poutine. They also carry vegan cheese and gravy. Not to be missed! Children between 4-12 will receive a $2 token to spend with our fruit and vegetable vendors. This week, our Sprouts recipe is "Choco’ Punkin’ Hockey Pucks". You can pick up your copy of the recipe at the Sprouts table when you check in. The Quarter Section Food Co. is back for the remainder of the season! Their Vegan breakfast muffins are sure to help your morning schedules, and with the weather changing to fall their array of organic breads will complement any comfort food. And don’t forget the line up of organic pastries and sweets. Dargatz Family Farm will be attending with acorn & spaghetti squashes, beets, broccoli, carrots, kale, kohlrabi, sugar pumpkins and zucchini. They will also have farm eggs, home canning (pickles, relishes, salsas, sauerkraut and jams) & fermented foods (sauerkraut, mixed raw vegetables and bell peppers). They will also be taking orders for whole frozen broiler chickens, for delivery next week (Oct. 3). Red Apple will be at the market with the freshest seasonal BC fruit available. For the rest of the season they have large mixed fruit baskets on sale. And be sure to inquire about their great prices on cases of peaches! This week's Fresh Sheet is up! Fall is finally here and with it comes many beautiful colors. Come visit your local market to experience gorgeous fall produce direct from your local farmers. There is beautiful cauliflower in multiple colors including purple, green, classic white and yellow, and a gorgeous array.of squash. Many of our artisans are also experimenting with autumn flavors, including everyone's favorite: pumpkin! The market is a beautiful place to shop and walk through before the white winter hits. This week in the Community Tent we will be hosting the Art in Our Park team. Art in Our Park is in it’s 9th year and celebrates community, diversity and the arts. It is a free family friendly event and will be held on Saturday, September 15th, 2018 at James Ramsey Park.. In 2018 we launched our Young Vendors Program, which gives 13 to 17 year olds a chance to sell their homemade products. This week we are hosting "Glimpses by Rebekah", who is bringing her wonderful photography. Jamaican Chefmon has 17 varieties of hot sauces, jerk marinade, banana ketchup, strawberry vinaigrette, & Jamaican patties and frozen meals. The goat curry & roti are a unique and delicious meal idea. Koha Apiaries will be bringing their locally produced liquid and creamed honey. Autumn flavors are now available! Pick up a jar of pumpkin spiced, lemon, ginger, or lime honey and try them out in tea, smoothies, cocktails, or on toast. This will be the last week for comb and chunk honey, so be sure to grab one to add to your next table setting or charcuterie board! Sunworks Organic Farm raises certified organic and BC SPCA humane chickens, beef, turkey, ducks, geese, pork, eggs. This week’s featured item is Chicken Italian Sausage. These Italian sausages are made with organic crushed tomatoes and are perfectly spiced with just enough heat. This is an extremely versatile sausage that is great by itself on a bun or in pasta or on pizza. Like all Sunworks sausages it is made with no preservatives, no GMO’s, no MSG and no fillers. Roka Wood Fired Pizza will be at the market with their 10" pizzas, made from hand-stretch, homemade dough. Yummy! The Davinci Cone is returning with their homemade gelato, specialty teas, coffees, and hot chocolate. Children between 4-12 will receive a $2 token to spend with our fruit and vegetable vendors. This week, our Sprouts recipe is "Nerdy Birdy's Lunchbox". You can pick up your copy of the recipe at the Sprouts table when you check in. Celebrate Gluten Free is the perfect option for those with gluten sensitivities. They always have amazing bagels, cupcakes, and loaves of bread available! Lori's Eats and Treats is back and are bringing mini pies (apple, pumpkin and blueberry), and some things may be on a stick! We will have Jamaican favourites , warm spices, gluten free and vegan options. There is something for everyone! Grey Arrow Farm will have seasonal produce, herbs, canning, apparel, and more! Riverbend Gardens has three tables full of the tastiest, freshest veggies you can find. This includes pumpkins & squash, carrots, potatoes, corn, beans, kohlrabi, and more. AIG Produce Osoyoos will be at the market this week with Gala, Mac, & honey-crisp apples, plus sweet & juicy o'hanery freestone peaches, & fresh nectarines. They will also have fruit baskets on sale. Grey Arrow had the most gorgeous autumn harvest display last week! JOIN US THIS WEEK FOR OUR FINAL BOUNCY CASTLE DAY OF THE YEAR (PLUS OTHER FUN KIDS ACTIVITIES)! Can you believe it's September already? The kids are heading back to school and the weather has gotten noticeably chillier in the past few weeks. However, at the SWEFM we aren't ready to give up on outside fun just yet! Join us this Wednesday for a bouncy castle, a J'Adore Dance-led activity, a special Sprouts game, and some pretty awesome fall weather that will make it a fun afternoon out to ease back into the return to school! This week in the Community Tent we will be hosting the Cornerstone Counselling Centre. This is a not-for-profit counselling centre with a mission to provide affordable counselling and mental health services to everyone. Telus, a Sprouts sponsor, will be at the market. Be sure to stop by their tent to speak to their great crew. They are bringing their Telus Tesla this week; don't miss out on having a peek at it! Cafe Bel Air will have artisan popsicles, a market favourite! Delicious Kicks Home Style Mexican Salsas, original natural ingredients and fresh flavour to be used as a dip, on top of any food and as an ingredient or even as a condiment when cooking. Jerky Jerky is back market for another great season, selling 100% Alberta Beef, locally made beef jerky in 5 great flavours! Koha Apiaries will be bringing their fresh comb, liquid, and creamed honey. Autumn flavors are now available! Pick up a jar of ginger, lemon, or lime flavored honey and try them out in tea, smoothies, cocktails, or on toast. Chunk honey will be available for the next few weeks; these gorgeous jars of honey make a lovely gift and look stunning at any table setting. Little Finger Bites makes healthy & yummy baby and kids snacks. Strathcona Spirits Distillery will be at the market for the first time ever with their gins & vodkas. Children between 4-12 will receive a $2 token to spend with our fruit and vegetable vendors. This week, our Sprouts recipe is "One in a Melon Pizza Pie". You can pick up your copy of the recipe at the Sprouts table when you check in. This week from 5-6pm, J'Adore Dance will be at the market leading an activity in the green space on the east side of the market from 5-6pm. It's going to be a blast! This is a bouncy castle week, so be sure to come on out! We always have a rotating lineup of buskers, balloon artists, and face painters, etc.., so keep your eyes open for these fun fixtures around the market. Confetti Sweets is back! Everyone's favorite cookie vendor is back with possibly the best cookies in Edmonton (did you know that their cookies went to the Oscars?). Look for their signature pink tent. AIG Produce Osoyoos will be at the market this week with fresh cherries & Ranier Cherries, raspberries, apricots, peaches, blueberries, blackberries, and apples! They also have sparkling beverages, jams, and fruit syrups. Red Apple will be at the market with the freshest seasonal BC fruit available. For the rest of the season they have $10 large mixed fruit baskets on sale. And be sure to inquire about their great prices on cases of peaches. Jen Ashley Jewelry will be at the market with affordable kids & adult jewelry! Vita Designs will have hand-stamped pendants, bracelets, leather wrap bracelets, and many more beautiful handcrafted items. This week we are hosting our first ever Corn-On-The-Cob day! It's the last summer market before the kids head back to school, so come on out for one more pre-school market bash! We are serving up free corn on the cob (while supplies last), generously donated by Riverbend Gardens, Holden Colony, and Johnson Fresh Farms. There will plenty of vendors on site, as well as the Terry Fox Foundation & Edmonton Food Bank Community Tent booths, buskers, and of course, the best local food & goods in the area! Join us here on the Fresh Sheet every Tuesday to see what's fresh and happening at your favourite farmers' market! Remember, please leave Fido at home; we are a pet-free market (service animals are allowed!). This week in the Community Tent we will be hosting the Edmonton's Food Bank Plant-A-Row, Grow-A-Row program. Each month Edmonton’s Food Bank serves over 20,000 people through its hamper programs while also providing food for 400,000 meals and snacks through affiliated agencies. During summer gardeners can help the Food Bank provide fresh local produce through the Plant a Row, Grow a Row program. Food Bank volunteers will be on hand to accept donations of fresh garden produce as well as non-perishable items. We will also be hosting the Terry Fox Foundation. For over 30 years The Terry Fox Foundation has worked to achieve Terry’s vision – a world without cancer. The Foundation will be providing info on the Terry Fox Run which is happening in September. Delicious Kicks has home-style Mexican salsas made out of natural ingredients, with no preservatives, no gluten and very low salt. These salsas can be used as a dip, to put on top of any food, as an ingredient, or even as a condiment for cooking. Sunworks Organic Farm raises certified organic and BC SPCA humane chickens, beef, turkey, ducks, geese, pork, eggs. This week's featured item is Roast Chicken Luncheon Meat. School is starting and it is time to start thinking about packing lunches again. This luncheon meat is pre-cooked and ready to go on your sandwich. A mild sandwich meat, it is Gluten and Dairy free and made with no preservatives, MSG, artificial flavors or food coloring. The Davinci Cone is returning with their homemade gelato, specialty teas, coffees, and hot chocolate, plus dessert waffles. Children between 4-12 will receive a $2 token to spend with our fruit and vegetable vendors. This week, our Sprouts recipe is "Royal Toad Tongues". You can pick up your copy of the recipe at the Sprouts table when you check in. This week from 5-6pm, J'Adore Dance will be at the market leading an activity in the green space on the east side of the market. It's going to be a blast! Baked 4 Yu has handmade ice cream mochi, mochi donuts, & mochi squares in fun flavours & colours. Come try this new chewy treat! Bread, Booth & Beyond Enjoying Carbs?? Go artisan!!! BB&B has fresh baked bread perfect for entertaining. Their breads are great for appies, bruchettas, dips and sandwiches. Try the giant pretzels, a great summer treat! AIG Produce Osoyoos will be at the market this week with fresh cherries & Ranier Cherries, raspberries, apricots, peaches, blueberries, blackberries, and apples! They also have sparkling beverages, jams, and fruit syrups! Steve & Dan's are back with their tasty selection of BC Fruit, including apples, peaches, melons, nectarines, apricots, & berries. Be sure to check out their sparkling fruit drinks & apple juice. Good Enough To Eat Soaps & Lotions has the prettiest soap "cakes" and "cupcakes" that you could imagine! Jen Ashley Jewelry will be at the market for the first time ever, with affordable kids & adult jewelry! This week's Fresh Sheet is up and we are ready for another great market! The dog days of summer are soon coming to an end, but don't despair... we still have seven more markets to go! That means seven more Wednesdays of local fruit & veggies, handcrafts, delicious foods, Sprouts tokens, buskers, and community spirit! Come out to the market to enjoy time with friends & community members, grab dinner or a snack, and to soak up the rays of the beautiful August sunshine. This week in the Community Tent we will be hosting the Edmonton Junior Tennis Society. This group is a non-profit community tennis program funded & supported by Tennis Canada, Tennis Alberta and generous sponsors. They provide affordable and accessible tennis programs for children and families in gyms, community centers, clubs and schools. This year we launched our Young Vendors Program, which gives 13 to 17 year olds a chance to sell their homemade products. This week we are hosting Shake It Off Designs. This company sells bracelets created by Evan, a special young man with Tourette Syndrome. A portion of all of his sales go to the Tourette society. Koha Apiaries will be bringing their freshly harvested comb, liquid, and raw honey. Creamed honey will be available in limited quantities this week, as they wait for the newly harvested honey to finish creaming. In the meantime, pick up a jar of ginger, lemon, or lime flavored honey to try in tea, smoothies, cocktails, or on toast. Little Finger Bites makes healthy yummy baby and kids snacks. This is their first market ever with the SWEFM! Michelle's Preserves will have fruit jams and jellies, veggie pickles, and canned fruit. The Spice Foundry is new, and is bringing his delicious gourmet spices. Sunworks Organic Farm raises certified organic and BC SPCA humane chickens, beef, turkey, ducks, geese, pork, eggs. This week's featured item is Chicken Mettwurst & Turkey Mettwurst. It is a flavorful sausage with notes of nutmeg, allspice & mustard. Try it on the BBQ, baked or in a stir-fry with all the great in season organic veggies! Made with no preservatives, no MSG, containing only Sunworks' meat, organic spices, salt and organic honey. Rapscallions Food Truck will be bringing their clever green onion cake tacos to the market again. These are created using locally made green onion cakes as the taco shell and topped with delicious flavours such as roasted pork belly and Thai chicken. The Davinci Cone is returning with their homemade gelato, specialty teas, coffees, and hot chocolate, plus dessert waffles (nutella & banana, nutella & strawberry, and s'mores)!!! Ukrainian House Food Truck is back for another season with authentic Ukrainian cuisine. Children between 4-12 will receive a $2 token to spend with our fruit and vegetable vendors. This week, our Sprouts recipe is "Stone Fruit Grumbler". You can pick up your copy of the recipe at the Sprouts table when you check in. Baked 4 Yu has handmade ice cream mochi and mochi squares in fun flavours & colours. Come try this new chewy treat! Sandra's Macarons - Sandra moved to Canada 5 years ago from Europe, & the recipe she uses has been in her family for over 200 years. These are the most original Macarons you can get! Macarons are gluten free, crunchy and chewy, & there will be different, delicious flavors available every week. Talk to Sandra about custom orders. AIG Produce Osoyoos will be at the market this week with fresh bartlett pears , nectarines, freestone peaches, fresh sunrise apples, fresh plums, cherries/Ranier cherries, jams and sparkling juices, and 5L fresh apple juice. They will also have all kind berries! Steve & Dans are back with their tasty selection of BC Fruit, including apples, peaches, nectarines, apricots, & berries. Be sure to check out their sparkling fruit drinks and variety of delicious fruit leather. We are halfway through August, and we are seeing a slow transition of the fresh produce available at the market. For example, the season for some fruits & veggies has passed, while cauliflower, corn, pickling cucumbers, and melons have been making their appearances. Soon we will be seeing a wonderful array of squash available! It pays to eat what is in season locally. Food always tastes best when it’s picked at its peak and sold within days. Often, food traveling long and far is picked prematurely and then refrigerated to prevent spoiling. Come to the SWEFM every Wednesday until Oct. 3rd to load up on what's in ripe & season in our wonderful province (and in BC, for your fruit needs). This week in the Community Tent we will be hosting the Edmonton Opera. This organization's purpose and vision is to present opera that inspires and moves their audiences. They will be promoting their upcoming season and will have a draw to win free season's tickets! The SWEFM's very first Bee Day is happening this week! Come to the market to chat with the folks from the John Janzen Nature Center, check out an observation (clear) bee hive, displays, costumes, and more. We also have a coloring contest and the chance to win bee-themed prizes! Easy as Pie is a new vendor starting this week, with pre-made meals & keto meals! Koha Apiaries will be bringing their comb, liquid, and creamed honey. Autumn flavors are now available! Pick up a jar of ginger, lemon, or lime flavored honey and try them out in tea, smoothies, cocktails, or on toast. Slices of 100% pure bees wax will be available for the next few weeks. SoupTime.ca is joining us with their huge selection of dry soup mixes. Have a fabulous meal ready in 30 minutes! Winding Road Artisan Cheese is at every second market. They have handcrafted artisan cheese made with Alberta organic milk and thistle rennet. This is award winning cheese from the heart of the County of Smoky Lake! Sunworks Organic Farm raises certified organic and BC SPCA humane chickens, beef, turkey, ducks, geese, pork, eggs. This week's featured item is Chicken Ginger Sunrise Sausage. This is the newest flavor of chicken sausage and given this great name by one of our customers. It is a wonderful, flavorful sausage whose main flavor notes are ginger, nutmeg and paprika. It is great for breakfast, lunch or dinner! Made with only certified organic meat, certified organic spices, sea salt and certified organic honey, it also has no fillers or preservatives. Children between 4-12 will receive a $2 token to spend with our fruit and vegetable vendors. This week, our Sprouts recipe is "World Cup Caramel Kick". You can pick up your copy of the recipe at the Sprouts table when you check in. Triple L Cakes has freshly baked gourmet cupcakes in assorted flavours, gluten-free baking, and cake pops! Riverbend Gardens will have new potatoes, peas, dill, beans, fennel, bunches of beets, and more. Red Apple will be at the market with the freshest seasonal BC fruit available. For the rest of the season they have $10 large mixed fruit baskets on sale! Jen Ashley Jewelry will have beautiful handmade necklaces and more. This week's Fresh Sheet is up and we are on track to bring you the best local food & wares in town! Mid-August is a wonderful time in Edmonton for local vegetables. From kale to corn to cauliflower (and everything in between), now is the time where almost everything is in season. Our vegetable vendors will have fresh produce of all sorts piled high this week, and many of our food trucks and ready-to-eat food vendors include local vegetables in their products at market. Don't miss out on this time of plenty! This week in the Community Tent we will be hosting Dogs with Wings. They will be at the SWEFM raising awareness of Assistance Dogs and Assistance Dogs in-training and bringing awareness to their foster home programs for raising a Service Dog in training! Come stop by and see how you can become involved and meet an Assistance Dog and/or Puppy in training! This week, Telus, a Sprouts sponsor, will be at the market. Be sure to stop by their tent to speak to their great crew! This year we launched our Young Vendors Program, which gives 13 to 17 year olds a chance to sell their homemade products. This week we are hosting "Luminescents", who sells homemade soy candles. Country Quality Meats has pepperoni, smokies, back bacon, garlic sausage, &more! Sunworks Organic Farm raises certified organic and BC SPCA humane chickens, beef, turkey, ducks, geese, pork, eggs. This week's featured item is Smoked Chicken and Turkey Breast. Make a salad or sandwich using these deli meats, which are pre-cooked so you can just add it to your salad or sandwich, or you can quickly sear it on the BBQ for added flavor. Made without nitrates, sulfates or preservatives, these products are also gluten, dairy & nut free. The Davinci Cone has homemade gelato, specialty teas, coffees, & hot chocolate, plus dessert waffles (nutella & banana, nutella & strawberry, and s'mores)!!! Children between 4-12 will receive a $2 token to spend with our fruit and vegetable vendors. This week, our Sprouts recipe is "Mucho Mud Slides". You can pick up your copy of the recipe at the Sprouts table when you check in. Celebrate Gluten Free is the perfect option for those with gluten sensitivities. They always have amazing bagels, cupcakes, and loaves o.f bread available! The Quarter Section Food Co. will have their pop up patisserie, along with stone baked organic sourdough and baguettes, the ever-popular baguette sticks, croissants and a myriad of other treats all made with local organic flour, Himalayan salt and artisan churned butter. This week's Fresh Sheet is up and we are excited to let you know that we have a bouncy castle planned this week! Our market is a wonderful place to support local businesses! From family farms to local start-ups, these vendors are the heartbeat of the market. Not only do they grow & create some of the best products in Alberta, but they employ locals, create financial independence for themselves, and have commitments to our communities. Be sure to stop and have a chat with these wonderful people, to learn more about their products and to hear their stories! This week in the Community Tent we will be hosting the SW Edmonton Seniors Association. SWESA is a non-profit association that was established in 2011 to address the social, cultural and recreational interests of people over 55 in southwest Edmonton. They offer a wide breadth of programming including information sessions on technology, lifestyle, health, and current events. They also offer health and fitness programs, outings and social gatherings where it is easy to meet and make friends. This year we launched our Young Vendors Program, which gives 13 to 17 year olds a chance to sell their homemade products. 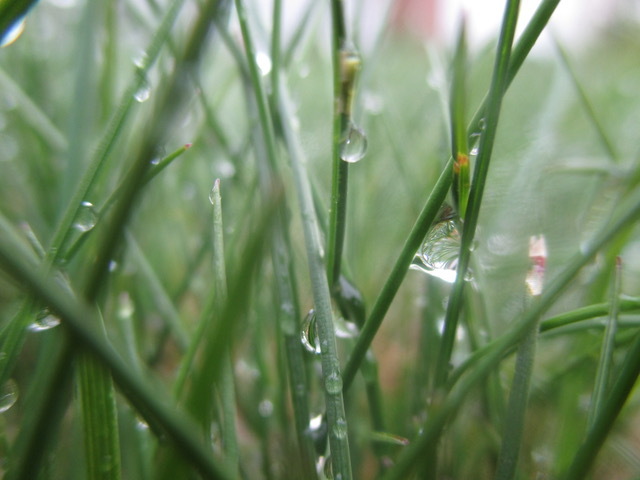 This week we are hosting "Glimpses by Rebekah", who is bringing her wonderful photographs. Koha Apiaries will be bringing their raw, heated, and creamed honey. Summer flavors are now available! Pick up a jar of raspberry or orange flavored honey and try them out in tea, iced tea, cocktails, or on toast. Slices of bees wax will be available for the next few weeks. Great for those who like to make candles and cosmetics, or perfect as a tool lubricant." Winding Road Artisan Cheese will have handcrafted artisan cheese made with Alberta organic milk and thistle rennet. This is award winning cheese from the heart of the County of Smoky Lake, and one of the vendors we are the most excited about! Children between 4-12 will receive a $2 token to spend with our fruit and vegetable vendors. This week, our Sprouts recipe is "Super Powered Evil Zombie Lumpies". You can pick up your copy of the recipe at the Sprouts table when you check in. Apothecary Baking Co. will be attending for the first time, with filled donuts, sticky buns, sweet & savory pies, & more. Lori's Eats and Treats makes gluten-free and vegan taste good! The usual Jamaican/Caribbean island treats will be available, including coconut drops, coconut roll (salara) & Jamaican sweet potato pudding along with their mini loaves. Dargatz Family Farm will will have vegetables, eggs, & fermented but unpasteurized sauerkraut or mixed vegetables. Holden Colony has been growing fresh vegetables for more than four generations. They grow & sell a variety of garden & greenhouse vegetables, pickles, sweet clover honey, poultry, eggs, and more. With some of the province's best produce, eggs, meat, and other ingredients arriving at our community market every Wednesday, we encourage you to make every meal made with local foods a celebration! Start dinnertime conversations about the taste of the new potatoes, the sweetness of the raspberries and the flavour combinations of your take-home meals. When everyone at the dinner table is vocal about their appreciation for the meal, it not only makes the cook feel great, but it gives our fantastic local foods the attention and celebration they deserve! The Terry Fox Run will have a tent at the market, and MLA Dr. Bob Turner will also be in attendance. Stop by to say "hello"& have a chat. This year we launched our Young Vendors Program, which gives 13 to 17 year olds a chance to sell their homemade products. This week we are hosting "BomBom Meringues", who have some of the tastiest sweets to be found at the market! Easy as Pie is a brand-new vendor starting this week, with pre-made meals & keto meals! Golomein Noodle House will be at the market with their frozen pork and beef noodle dinners. This delicious cuisine was created in Brunei and should not be missed. Granola by Jan is bringing homemade granola to the market. Try her Maple & Walnut made with 100% Canadian maple syrup or Hazelnut & Honey made with pure raw honey from a local producer. Thai Saab Food Co. will be bringing their delicious Thai foods to market this week. Don't miss out on the fabulous rice or salad rolls! Sunworks Organic Farm raises certified organic and BC SPCA humane chickens, beef, turkey, ducks, geese, pork, eggs. This week's featured item is Chorizo Sausage- their most spicy sausage, and Ron’s favorite! It has the perfect amount of spicy heat, and can be added to pasta, pizza or just eaten on its own. Like all of Sunworks' sausages, it is made with no artificial ingredients, no fillers, no gluten and no preservatives. Children between 4-12 will receive a $2 token to spend with our fruit and vegetable vendors. This week, our Sprouts recipe is "Tiger Claws and Alligator Skin Muffins". You can pick up your copy of the recipe at the Sprouts table when you check in. e2 Young Engineers will be in the tent beside Sprouts. Bring the kids by for some interactive activities. Grey Arrow Farm will have produce, herbs, canning, and more! Gruger Family Fungi has locally grown mushrooms, ethically cultivated with recycled material and handpicked for peak nutrition. Peas on Earth Certified Organic Garden has the tastiest organic vegetables in town. Red Apple will be at the market this Wednesday with the freshest, seasonal BC fruit available. Starting this week they have $10 large mixed fruit baskets on sale! Steve & Dans are back with their tasty selection of BC Fruit, including apples and berries. Be sure to check out their sparkling fruit drinks and variety of delicous fruit leather. Brew & Bloom will have specialized teas, flower crowns made on the spot (using fresh flowers! ), fresh flower arrangements, succulents, gift boxes and more! Vanderbloom will be at the market with their gorgeous clothing. Wild Yarrow Herbal Medicine has teas, tinctures, sunscreens, lipbalms, and many other unique products. This week at market is looking wonderful; the variety of produce available is increasing every week. Check out the huge selection of fresh greens, potatoes, fruits, and other veggies in your favourite stalls. And, did you know that the market has expanded? This year we have cheese, beer, distilleries, coffee roasters, florists and more. 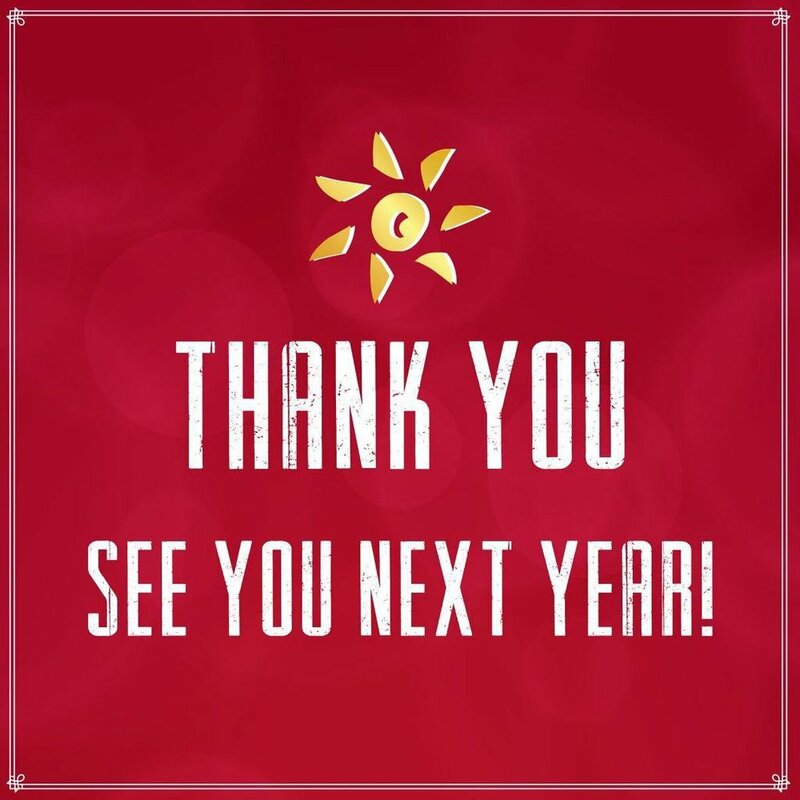 Each year gets bigger & better! This week in the Community Tent we will be hosting the Edmonton Junior Tennis Society. This is is a non-profit community tennis program funded and supported by Tennis Canada, Tennis Alberta and generous sponsors. They provide affordable and accessible tennis programs for children and families in gyms, community centers, clubs and schools. With an emphasis on skill development, children participate in mini-tennis formats that use age and skill appropriate equipment and court sizes, to ensure early success and enjoyment. Mona's Kitchen will have low-sugar artisan jams, sweet & savoury baked goods, and celiac & vegan friendly pancake mixes. Country Quality Meats has pepperoni, smokies, back bacon, garlic sausage, and more! Sunworks Organic Farm raises certified organic and BC SPCA humane chickens, beef, turkey, ducks, geese, pork, & eggs. This week they are featuring Garlic & Rosemary Sausage. Available in both chicken and turkey, this was the second sausage they ever made & is still one of their most popular flavors. It is excellent on its own or in any recipe, and is. gluten free, nut free, dairy free & preservative free. Children between 4-12 will receive a $2 token to spend with our fruit and vegetable vendors. This week, our Sprouts recipe is "Drop Mad Beets". You can pick up your copy of the recipe at the Sprouts table when you check in. This week, Telus, a Sprouts sponsor will be at the market. Be sure to stop by their tent to speak to their great crew! Baked 4 Yu has handmade ice cream mochi and mochi squares in fun flavours and colours. Come try this new chewy treat! Bread, Booth & Beyond Enjoying Carbs?? Go artisan!!! BB&B has fresh baked bread perfect for entertaining. Their breads are great for appies, bruchettas, dips and sandwiches. Try the giant pretzels & cheese sticks, a great summer treat! Grey Arrow Farm is a new vendor at the market this year, and will have produce, herbs, canning, and more! Riverbend Gardens will have new potatoes, peas, dill, and bunches of beets. AIG Produce Osoyoos will be at the market this week with red cherries, Rainer cherries, raspberries, strawberries, and pink lady, Ambrosia, and gala apples. They also have sparkling beverages, jams, and fruit syrups! Red Apple will be at the market this Wednesday with cherries, raspberries, blueberries, apricots, apples and PEACHES. They also have $10 large mixed fruit baskets on sale! We love the cheeriness that Brew & Bloom bring to the market! This week's Fresh Sheet is up and we are lovin' the sun! Last week the market was hot and busy! The bouncy castle was a huge hit with the kids, as were our free Canada Day treats. It was a fantastic summer day, and we loved seeing all of the families, kids, and community members coming out for a day at the market. 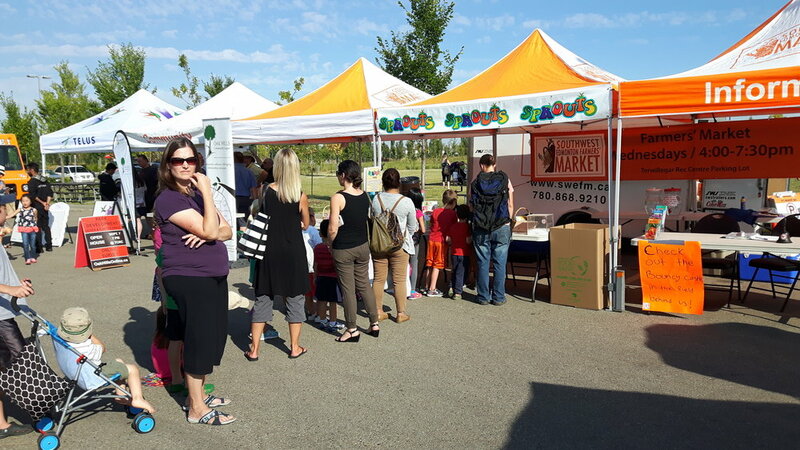 It's looking like this week will be just as hot & lovely so come on out and soak up the sun at Southwest Edmonton's local community market. This week in the Community Tent we will be hosting the Strathcona Place 55+ Centre, a city-funded centre that has activities, recreation, art programs, special events, and outreach services. They offer many programs for the 55+ community including inter-generational and multicultural activities. The center is located at the heart of the university area and is volunteer driven to serve the needs of the community. This year we launched our Young Vendors Program, which gives 13 to 17 year olds a chance to sell their homemade products. This week we are hosting "Glimpses by Rebekah", a wonderful photographer. Ukrainian House will have a variety of sauerkraut on offer.! Sunworks Organic Farm raises certified organic and BC SPCA humane chickens, beef, turkey, ducks, geese, pork, eggs. This week's featured item is Montreal smoked beef; this sweet and spicy sliced beef is pre-cooked and oh-so perfect on a sandwich or in a salad. Naturally smoked, it has a subtle smoke flavor that is the perfect compliment to the spices. It is also wheat/gluten free, dairy, and nut free. Children between 4-12 will receive a $2 token to spend with our fruit and vegetable vendors. This week, our Sprouts recipe is "Knobbly Kneed Stork Legs". You can pick up your copy of the recipe at the Sprouts table when you check in! Lori's Eats and Treats makes gluten-free and vegan taste good! The usual island treats will be available, including coconut drops, coconut tart (gizzada) and Jamaican sweet potato pudding along with their mini loaves. Take Me Away Essentials has body butters & oils, bath soaks, hair products, and more. Treat yourself to some self care! ZypChicks will be at the market this Wednesday and will featuring their hemp skin care, made locally from locally grown hemp! Purchase ANY skin care product and ZypChicks will gift you a 100 g bag of hemp! ...just their way of saying THANK YOU to their customers! Hemp: love yourself, inside and out! We hope that everyone had a fabulous Canada Day long weekend! We have a fun market planned this week, with a bouncy castle for the kids (free-of-charge to bouncers! ), plus we are handing out 400 FREE treats from our vendors to celebrate Canada Day (a bit belatedly!). Come out with your kids, family, and friends, and enjoy checking out all of our great artisans and food vendors! This year we launched our Young Vendors Program, which gives 13 to 17 year olds a chance to sell their homemade products. This week we are hosting BomBom Meringues, who have an array of delicious lollipops and cookies! Granola by Jan is bringing homemade granola to the market. Try her Maple & Walnut made with 100% Canadian maple syrup or Hazelnut & Honey made with pure raw honey from a local producer. Granola by Jan is delicious and shhh, don’t tell anyone, but’s it’s good for you too!! Winding Road Artisan Cheese will be at every second market. They have handcrafted artisan cheese made with Alberta organic milk and thistle rennet. This is award winning cheese from the heart of the County of Smoky Lake, and one of the vendors we are the most excited about! Sunworks Organic Farm raises certified organic and BC SPCA humane chickens, beef, turkey, ducks, geese, pork, eggs. This week's featured item is their Chicken Pepperoni, available in sticks and as a bigger link perfect for pizza. This is a wonderfully spiced mild pepperoni that has just enough of a spicy kick. Pre-cooked and naturally smoked, with no nitrates or sulfites, no fillers and no preservatives or chemical additives, it is ready to eat. Great for pizza night, camping, lunches or a picnic. Celebration Mini Donuts will be at the market with their melt-in-your-mouth regular and gluten-free mini donuts These are sure to be a big hitter as a summer-time treat! Baked 4 Yu is new to the market this year, with handmade ice cream mochi and mochi squares in fun flavours and colours. Come try this new chewy treat! Triple L Cakes has freshly baked gourmet cupcakes in assorted flavours, gluten free baking, and cake pops! Dargatz Family Farm will have available for sale this Wednesday fresh--not frozen--broiler chickens. These are scheduled for slaughter on Tuesday and will be for sale at SWEFM on Wednesday. This is also their last market until Aug. 1. Peas on Earth Certified Organic Garden starts at the market for the first time ever this week! Visit them for the tastiest organic vegetables in town. Red Apple will be at the market this Wednesday with the freshest, seasonal BC fruit available. Grey Arrow Farm has some super apparel!